His caption on the post raised some eyebrows. 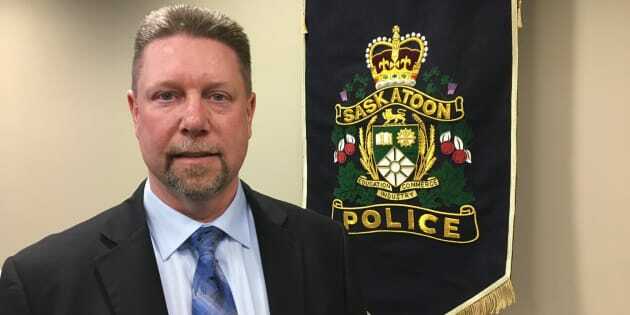 Saskatoon's police chief tweeted a drawing his daughter made as a child to celebrate International Women's Day on Thursday, but his caption was met with some backlash. Troy Cooper explained that the card from years ago made him proud because his daughter wrote "go policemen go" and then added "and girls" to it. The child's drawing includes a police officer and a stick figure on top of a car. Cooper added in his tweet: "Please ignore the fact that the officer is shooting up the place." The tweet was posted on Cooper's account on March 8 and was deleted the next day. It's that last line that some people found insensitive. "Carry on SPS, and hope people keep ignoring the brutality of your police force," one person replied. "Please ignore the fact that the officer is shooting up the place" -- carry on SPS, and hope people keep ignoring the brutality of your police force. Not sure why you are celebrating this. You taught your daughter to praise violence. A supportive reply to the chief's tweet that said "Stick people lives matter" was liked by Cooper's account, which many on the social media website interpreted as mocking the Black Lives Matter movement, which protests police brutality. Cooper's account liked the following tweet in reply to his post. "It's unsurprising but still acceptable that @SaskatoonPolice would enjoy mocking BlackLivesMatter & the violence that Black & Indigenous people - including girls and women - continue to face at the hands of police, including their force," Indigenous activist Erica Violet Lee tweeted. It's unsurprising but still unacceptable that @SaskatoonPolice would enjoy mocking BlackLivesMatter & the violence that Black & Indigenous people - including girls and women - continue to face at the hands of police, including their force. HuffPost Canada reached out to the Saskatoon Police Service over the phone and via email about Cooper's tweet, but did not hear back. Saskatoon's force has a complicated history with police brutality, particularly when it comes to Indigenous people. The force has been called out for its alleged use of excessive force on several occasions. Human Rights Watch published a report that detailed police abuse of Indigenous women in the province. Several reported incidents, dubbed "starlight tours," allege officers from the SPS picked up Indigenous people and drove them outside the city, abandoning them on freezing cold nights. 17-year-old Neil Stonechild's body was found in a field on Nov. 25, 1990 where he'd frozen to death, Maclean's reported. An inquiry led to two officers being fired from the force but no criminal charges were ever laid. Another Indigenous man, Darrell Night, was left at the city limits in January 2000 and had to walk back to the city in the freezing cold in only a T-shirt. At least two other men were speculated to have died in this way. Numerous recommendations have been made in light of the incidents to improve police procedures. The "starlight tours" section of the force's Wikipedia page has also been deleted on at least two occasions by someone using a computer inside the police station, according to CBC News. Saskatoon police chief Troy Cooper at his swearing in ceremony on Feb. 28, 2018.
Cooper's appointment, as the first Metis police chief in Saskatoon history, was supposed to be a turning point for the force and its relationship with the community. His tweet comes at a particularly sensitive period for Indigenous communities in the province. Cooper was sworn in less than three weeks after Saskatchewan farmer Gerald Stanley was acquitted in the death of Colten Boushie, and at a time when people across the country are having conversations about the relationship between Indigenous peoples, law enforcement and the justice system. "We're going to include the Indigenous community in our service and in our service delivery in new ways, so that their voice is heard and officers have regular positive personal experiences with culture," Cooper said after he was sworn in on Feb. 28. Sometime on Friday evening, the tweet was deleted from the chief's Facebook page. The "stick people lives matter" was still liked on Cooper's Twitter account at the time of publishing.